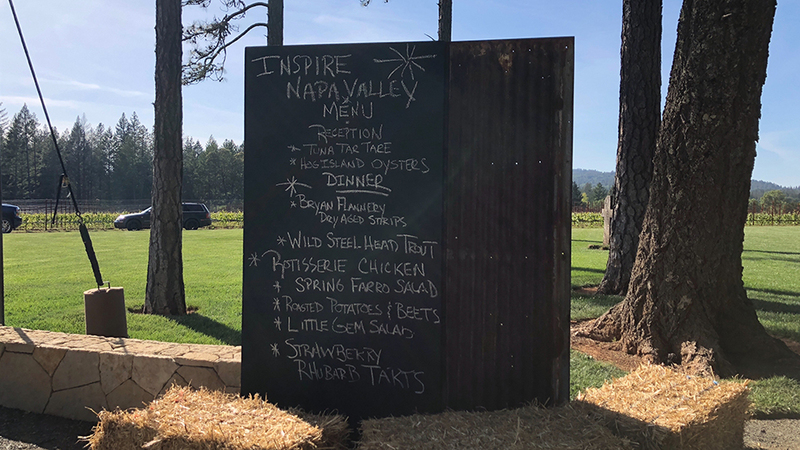 I was thrilled to serve on the Honorary Committee for the inaugural edition of Inspire Napa Valley, along with Brad Grimes, Ray Isle, Samantha Rudd, David & Monica Stevens and Fran Tarkenton. The brainchild of Kerrin Laz, Inspire Napa Valley is a weekend of fabulous tastings, seminars and dinners held to benefit Alzheimers’ research. In its first edition, Inspire Napa Valley raised over $1 million. 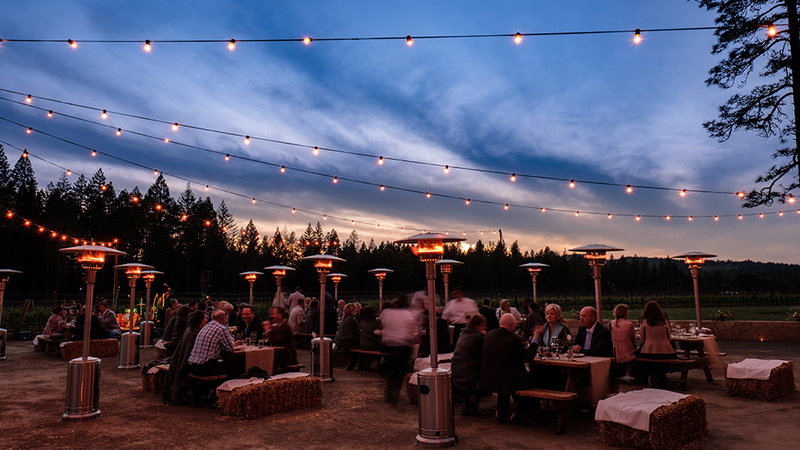 The weekend started with an intimate dinner served outdoors in David Abreu’s Las Posadas Vineyard on Howell Mountain. 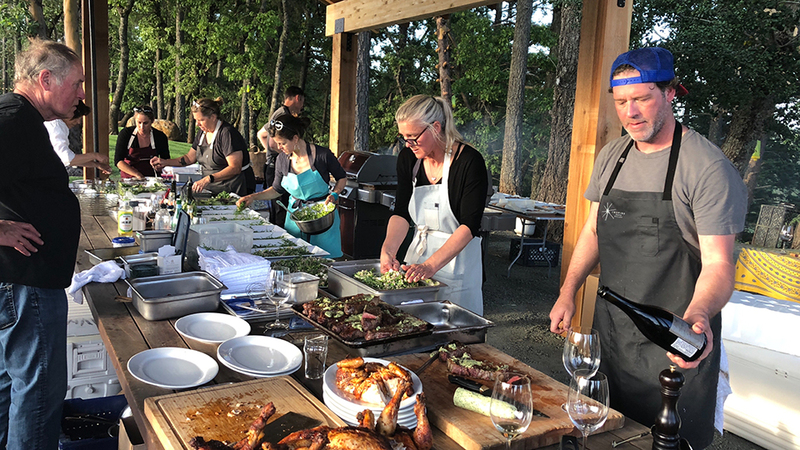 Longtime Abreu Winemaker Brad Grimes, a former professional chef, and his wife, Katherine, a private chef, prepared a fabulous meal for a small group of just 75 guests. 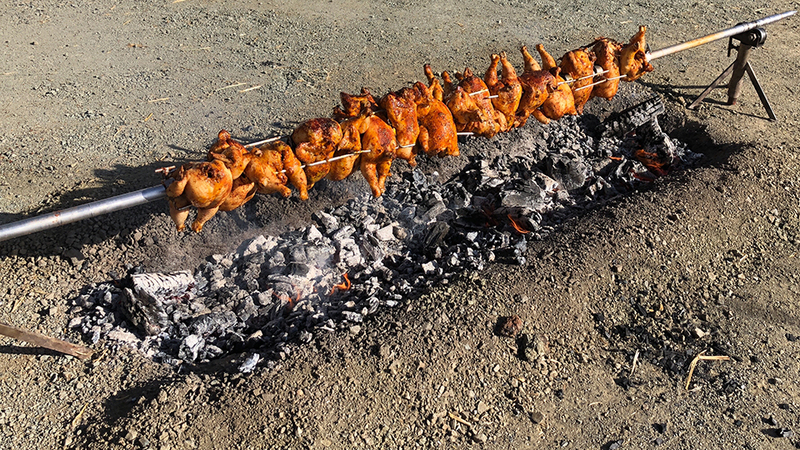 Strip steaks from Bryan Flannery, steel head trout and roasted chickens cooked on an open spit were among the highlights on the menu. The array of Abreu wines looked tantalizing. Unfortunately, I did not taste any of them, as I was occupied helping out in the kitchen with plating and serving dinner. Les and Lisa Behrens, Françoise Peschon, D.J. Warner, Helen Keplinger and Remi Cohen rounded out the team of sous-chefs. It was a classic Napa Valley day, with a warm, sunny afternoon that gently melted into a cool, chilly night. Above all else, though, it was one of those rare magical moments in life where everything feels just perfect. VIP Guests convened on Saturday morning for a VIP tasting at Press in St. Helena. 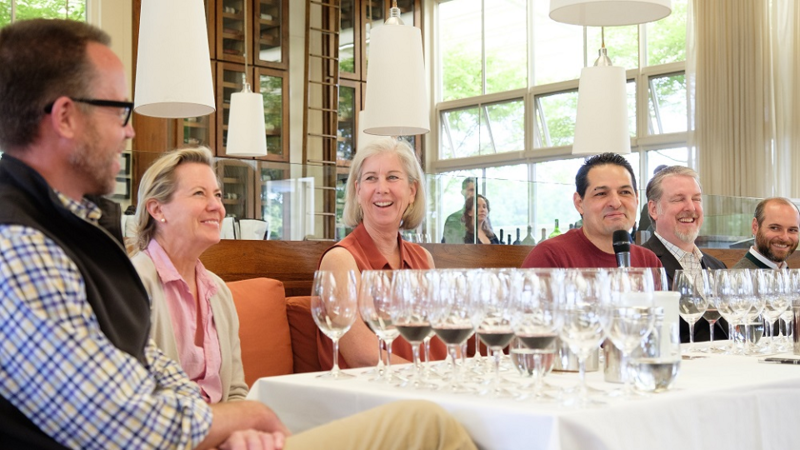 I moderated a panel with Vine Hill Ranch Owner Bruce Phillips, Harlan Estate Vineyard Manager Mary Maher, Winemaker Celia Welch, Redd Wood Wine Director Willi Sherer and Graeme MacDonald. Each panelist presented two Napa Valley wines that had been important in their personal development. Freed from the confines of more typical vertical or horizontal tastings, all ten wines really shined. 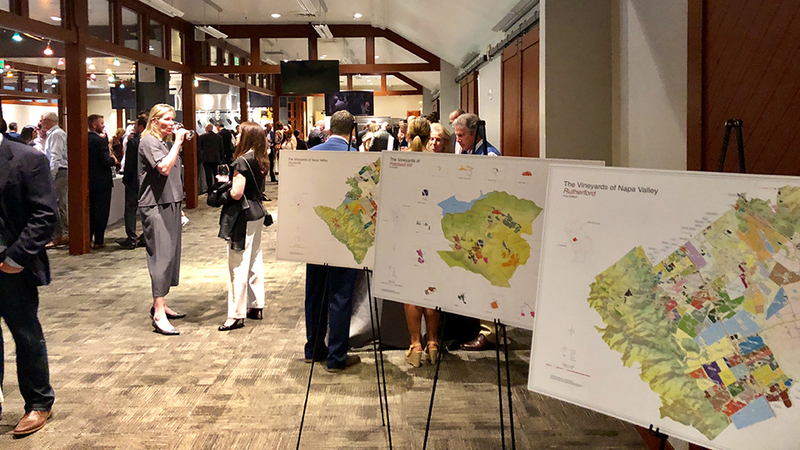 I was also honored to have an opportunity to share our work in mapping the vineyards of Napa Valley with our collection of seven maps on display. The 2001 Etude Cabernet Sauvignon, chosen by Mary Maher was at a glorious peak of expression. I also thought the 2007 Chappellet Cabernet Sauvignon Signature, selected by Celia Welch, was stellar. Willi Sherer offered two younger classics; the 2013 Spottswoode Cabernet Sauvignon and 2014 Corison Cabernet Sauvignon Sunbasket, both of which were super-expressive. 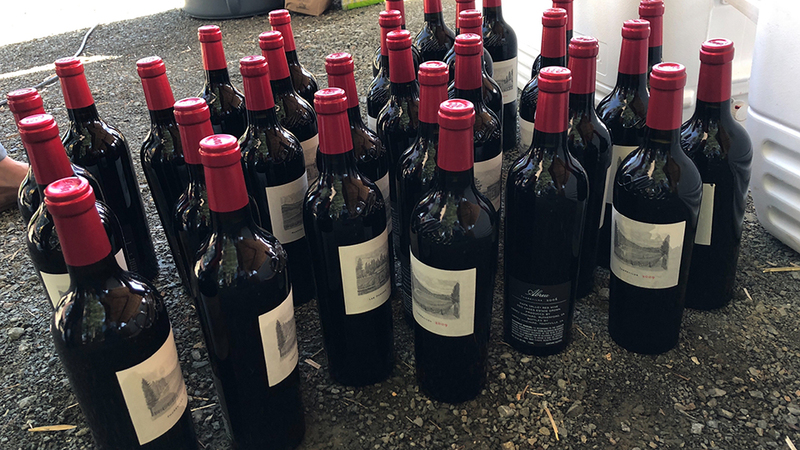 For Bruce Phillips, it was two Napa Valley icons; the 2012 Cabernet Sauvignon Georges de la Tour from Beaulieu and the 2013 Cabernet Sauvignon Martha’s Vineyard from Heitz, which were very good, but short of truly exciting, or truly memorable. The 2014 Togni Cabernet Sauvignon and 2015 Kongsgaard Chardonnay offered by Graame MacDonald showed the inspired work of two truly artisan families in Napa Valley. I thought the Togni showed especially well. Alzeihemer’s Association Chief Science Officer Maria Carrillo wrapped up the morning session with an update on several key research topics and an overall state of where things stand in our present day understanding of Alzheimer's. It was a terrific morning all around. From there, guests made their way to the Culinary Institute at Greystone for fabulous walk around tasting with the greatest collection of Napa Valley wines I have ever seen in one place. Virtually every top Napa Valley estate was represented. I would have liked for the room to be cooler, but hopefully that is something that can be easily addressed in future editions. The Live Auction Dinner was fun, spirited, and raised a whopping $1m. 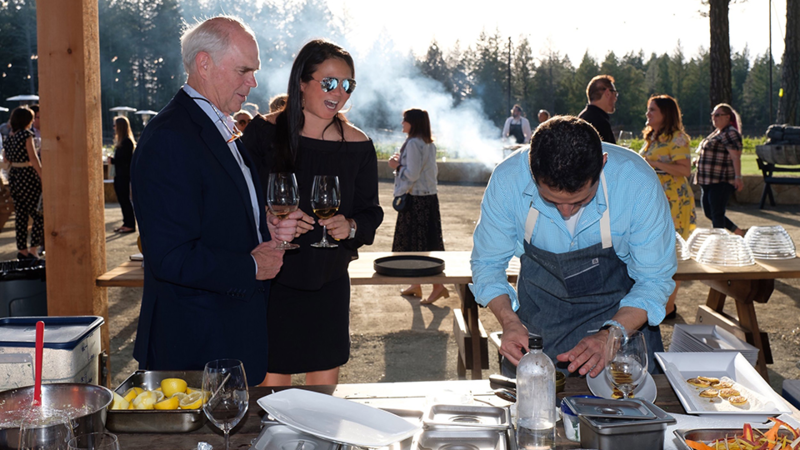 Veteran Auctioneer Ursula Hermacinski tantalized guests with a series of once-in-a-lifetime lots from Screaming Eagle, Julian Van Winkle, Bryant and Meadowood Chef Christopher Kostow, and Vine Hill Ranch, among others. Live music and dancing brought the night to a rapturous close. Sunday's VIP Brunch at Thomas Keller’s AdHoc was a fun, low-key way to wrap up the weekend. This year, Inspire Napa Valley will be held May 3-5. The format will be quite similar to last year’s event, although some of the venues will naturally be different as we rotate through locations. Friday’s VIP dinner will be held at Rudd Estate, while the Saturday morning tasting will take place at the Napa Valley Reserve. It is sure to be another fabulous weekend of wine, food and comraderies, all for a very worthy cause. Tickets go on sale next week.